The Black Student Union, in collaboration with the Student Life and Leadership, threw a 70’s 80’s and 90’s dance on Friday, Nov. 16. The event was free. Although attendance started off relatively low, by 10 p.m. there were a large number of Bruins swaying to the beat of music from artists such as Michael Jackson, Mariah Carey, Journey and The O’Jays. “Yea it’s really fun, there have been some nice jams, and they matched the eras,” says SLCC English major Kealey Gill. 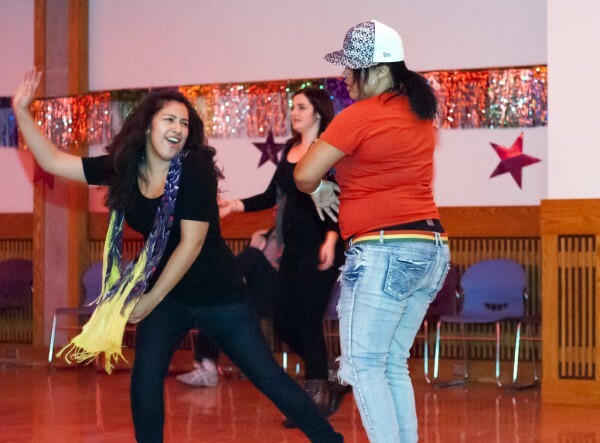 The dance was held from 8 p.m. to midnight in the Taylorsville Redwood Campus Student Event Center, which gave students ample space to dance freely. A group of bruins attended the dance along with one non-local student; all of them were dressed according to the decade in which they were born. The stand-alone student from Utah State University seemed to enjoy it just as much as the SLCC students. “It’s a great environment and everybody is friendly,” says aggie Manson Kafi. The dance served as a cultural engagement as well, because of the wide variety of students with diverse backgrounds that attended. The Student Event Center was filled with students that ranged from African, African American, Polynesian, Caucasian, Hispanic and Asian. They all came together and created a peaceful energetic atmosphere. From the sidelines, SLCC campus security guard Karl Gold noticed the culturally diverse setting and the positive vibe. Music became the common denominator in the event, as it brought everybody together in harmony. “The dance was fun, it was nice to see all the different faces and people from different decades find a common linking in music,” said Black Student Union president Koyom Koyom. Although the dance was initially made to bring students together, the energy that was surging in the building ignited life in faculty members as well. Some faculty members from Student Life and Leadership got involved as well as faculty from the Black Student Union. “Seeing some of the mature members out there made me feel like the dance was a success,” says Koyom. Collaboration for the event between the Black Student Union and Student Life and Leadership was largely accidental. “We first discovered the BSU wanted to do a dance on the same day that we did, which was problematic because we didn’t want to have two dances on the same day, so we said hey lets work together,” says student body president Aaron Starks. Through a simple compromise and collaboration, the BSU and Student Life and Leadership were able to create something positive for students. “The experience has been good. I wish I knew how to dance,” says bruin Sina Arman.